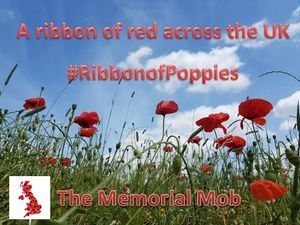 The Memorial 'Mob' are creators of memorials, walks, publications and events to help remember all the 'Uniformed' Services (Armed & Emergency Services) and of course The Ribbon of Poppies. The first memorial designed however was one for the Centenary of Scouting in 2007 in Iver Heath, Buckinghamshire. 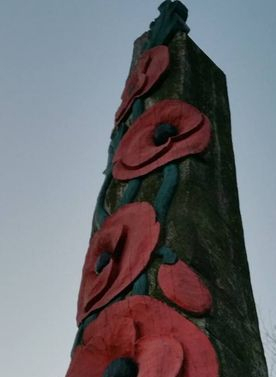 The memorial is in the form of a Totem Pole, a totem pole often marks an area or an event. 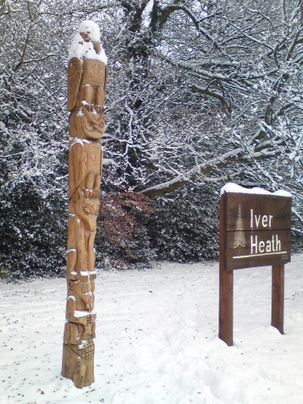 Carved on the pole are various creatures connected to Scouting and the Guide Movement. 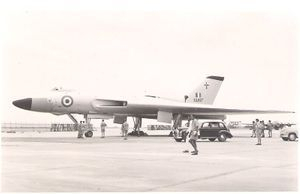 Since then we have gone on to create a memorial in Oxfordshire to remember the loss of a Blackburn Beverley Transport aircraft XH117 in 1957, the first of the Vulcan Bombers XA897, a memorial for Air Dog Buster, The Ribbon of Poppies - a global act of Remembrance, with more to come. Our initial idea in 2017 was to create a "carpet of crimson" from Lands End to John O'Groats to remember all those killed or wounded in WW1.However given the power of the Internet, it quickly surpassed our initial plan and now stretches from the Orkney Islands in the North to the Falkland Islands in the South and to the West Los Angeles, California and we are now as far East as Indonesia, Australia and New Zealand. #RibbonofPoppies - the image above is of the actual field in Iver Heath, Buckinghamshire that was in part the inspiration for the Ribbon. Iain Henderson (the creator) was inspired by the Tower of London poppies and wanted a way all could take part in a memorial project in 2018. Another inspiration was our Poppy UK logo, which in an ideal World would see us create at least one memorial in each UK County to a lost and forgotten event. But on reflection we realised that the humble poppy could actually become the "living" memorial as opposed to ones of wood, stone or metal. All you need to take part is a pocket of land and a packet of seeds, if you don't have a garden of your own, some groups have organised with the local council to sow poppies in the local parks, roadsides, schools and other public land. We aren't seeking to make money from this project as all we wish to do is to create a living legacy to those who paid the ultimate sacrifice. To follow the project you can find details of how to grow poppies and potential seed sources @RibbonofPoppies on Facebook & Twitter. All groups, companies, sports clubs, individuals, faith groups, the Armed & Emergency Services, transport companies (etc) are all welcome. There are many places to source poppies from online suppliers and we highlight other options on line, but also check your Garden Centre. You can get poppies for around a £1 a packet on Ebay for around 80,000 seeds. Once you have them, you can sow from the Spring right through the year. You should sow in land that has been cultivated and in a sunny or partially shaded area (if in a warmer climate please check as full shade maybe better). Another idea is to sow in batches to ensure more blooms over the year. Please do not introduce any non-native plants and only sow only where you have permission to do so. 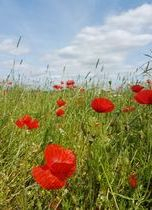 Having seen reports recently about the lack of meadows and wildflowers to encourage and support wildlife, we would like to invite communities and landowners to create Fields of Remembrance or Memorial Meadows if you prefer. We appreciate a mix of flowers will help create a better environment, but many flowers and plants hold significance as those which serve to remember, from daisies to forget-me-nots and bluebells to rosemary and of course poppies (red and purple of course). We would like one meadow in each county if possible, more if possible. 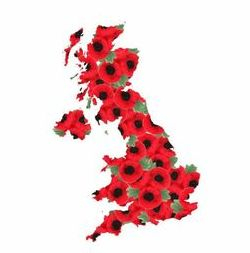 Another suggestion is to create Routes of Remembrance, which would require support from local councils, highways and or railways to create a living memorial along main roads and rail networks (from planters on stations to railside properties - with permission of course). We would also like to thank the GBC - Gibraltar Broadcasting Corporation for their coverage in September 2017. 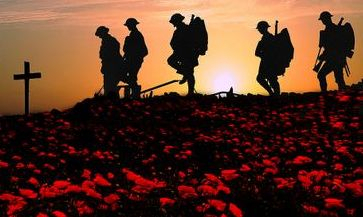 There is now no requirement to register in 2019, just buy your poppies and sow, the cheapest supplier we have found is on Ebay and for 99p you can have over 80,000 seeds in one packet! If you would like to help with any projects, we are looking for hiking clubs to help map routes for some long distance walks/routes and we are always interested in assistant researchers and fundraisers. RAF Police Dog 'Buster' attended the first 2 memorial unveiling events to Blackburn Beverley XH117 (The Sutton Wick Air Crash) and on his passing away shortly after the second event at Fort Paull, we felt it would be fitting to work together on a memorial for Buster at RAF Waddington. 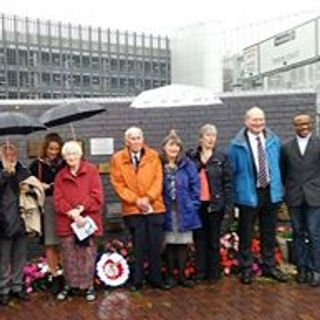 On the 16th of July 2016 Will and Tracey Barrow unveiled the Memorial to Buster in front of an invited crowd made up of current and veteran Royal Air Force Personnel and 'friends and admirers' of Buster. 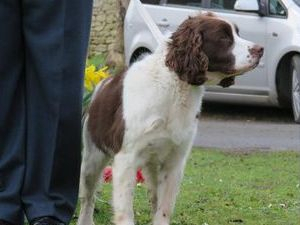 The event received top billing on BBC Look North who have followed Buster's work closely. 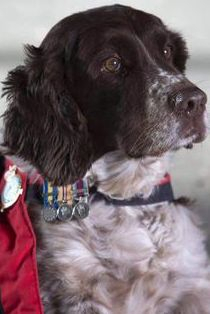 We felt it was about time a memorial should be created not just for Buster but all Military Working Dogs, we aim to have the first one at Holywell in North Wales who have kindly offered a site for free and have offered a start up fund. The Memorial will honour 'Buster' RAFP in the Mascot section, 'Judy' the Dickens Medal winner who served with the Royal Navy. We will also remember 'Lucky' an RAFP German Shepherd Dog and Theo (Liam Taskers dog) both these dogs were also Dickens Medal winners. The memorial project was recently unveiled at the Houses of Parliament with a host of MP's and the patrons and trustees present. 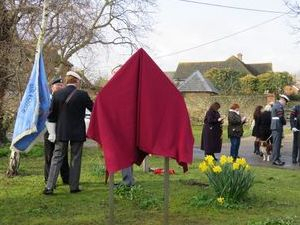 On the 5th of March 2016 at Sutton Wick Lane, a new more lasting Memorial was unveiled at the scene of the 1957 Sutton Wick Air Crash. There was a number of relatives of those tragically killed in the gathered crowd, members of local councils, including local Parish Councils and District Councils. Also members of the local community and the Armed Services, both active & reserve, past & present, including canine representatives from RAF Brize Norton. 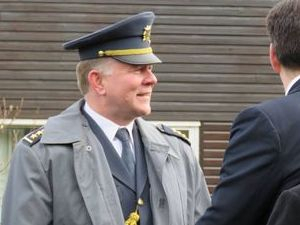 A special guest from the Czech Embassy attended to remember the Czech born crew member Jindrich Zarecky who was serving with the RAF at the time of the crash. 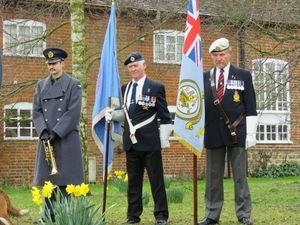 A shot from the recent 2016 unveiling of the new memorial by Mr Brian Eastoe, a local resident of Sutton Wick Lane, with the RAFPA Standard and the RAF PTi Standards and Bugler. On Sunday the 5th of March 2017 starting in St Peters Church, Drayton The Memorial 'Mob' welcomed those affected by the crash of XH117Z a Blackburn Beverley to their special service to mark the 60th year since the incident. On conclusion of the formal service, the team moved up to the Memorial we unveiled in 2016, to lay wreaths in Sutton Wick Lane. The weather forecast was set to be dire so we held most of the event in St Peters Church. However we hadn't needed to be worried, as the weather was glorious for early March and the sun shone over the Lane. 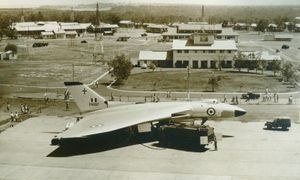 However not in time to reverse the cancellation of the flypast by an A400M Atlas Transport aircraft, an aircraft that would have been the modern equivalent of the Beverley. 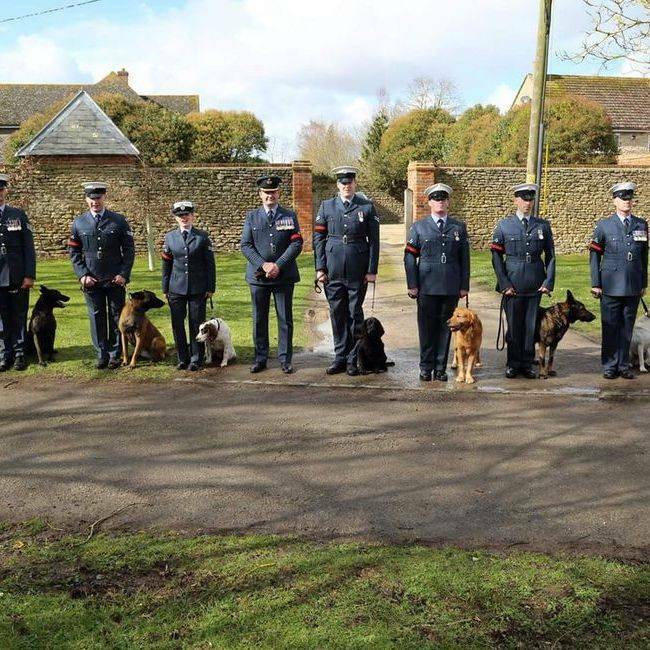 The Royal Air Force Police formed a Guard of Honour or more a Parade of Paws as the congregation were greeted by a 'pack' of RAF Police Dogs and their handlers, one each to represent the 8 handlers lost in 1957. For more images of the event please see out Facebook Page or our Twitter Feed. Please park with respect for the local residents and keep private driveways free. 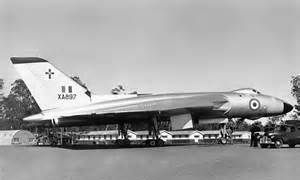 On the 1st of October 1956 the first Vulcan bomber XA897 was returning from a World tour, when it crashed on final approach to London Heathrow. Two crew were able to eject, but sadly the rear four seats had no ejection system and were too low to bail out. The four rear crew were all killed. 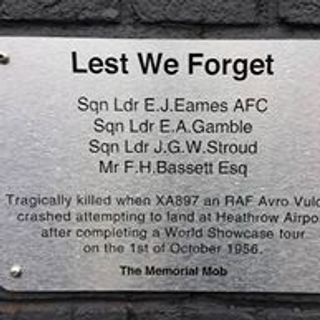 The Memorial Mob would like to improve the basic memorial at London's Heathrow airport - the site of the crash of XA897 in 1956. 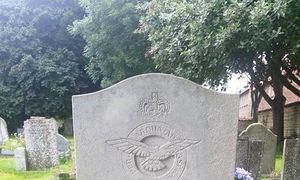 But also add a memorial at RAF Waddington - the base unit of XA897 and finally a memorial at the Avro Heritage museum, where all the aircraft where built and close to the final resting place of Freddy Bassett. We have now have a new woodcarver and we have picked out the memorial site and been gifted a tree. This will honour the Troops based locally in the area including those of the Canadian Forestry Corps during both #WW1 and #WW2. One of whom died near Black Park in WW1. To honour them and their Canadian comrades we are creating this totem pole to mark. 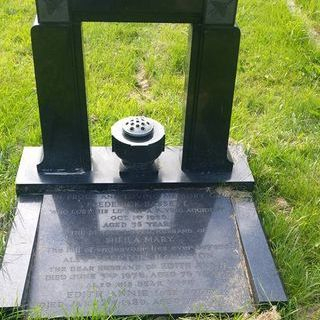 The Buster Memorial at the RAF Waddington Memorial Gardens is now we are pleased to say in place and looks stunning! It was unveiled on the 16th of July 2016 a year to the day Buster sadly passed away. A huge thanks to Scott Etheridge for his help and the masons, who have done a superb job. The Mob are working with local groups and suppliers to create a Memorial to Blackburn Buccaneer XN952. 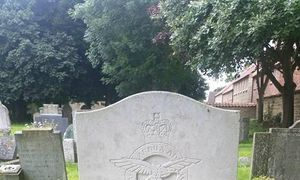 It sadly crashed whilst testing at Holme on Spalding Moor, killing both crew members. On the 2nd of July 1941 on the GWR line from Paddington Station to the South West & Wales at the above named junction (between Slough & Langley) due to a signal error, 2 trains collided head on. 5 people tragically died and 24 were injured. 3 of those killed were members of the Royal Navy Patrol Service on their way home on leave. 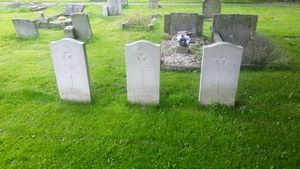 We hope to create a memorial (or two - 1 for Slough and 1 for Langley, if funds are forthcoming). Initial thoughts were the crash may have been due to enemy action - bomb damage on the tracks. We are still researching the crash and have launched an appeal via BBC Devon. The team at the Slough and Windsor Railway Society have offered to assist in the placing of a memorial at Slough Railway Station to remember the crash and we are hoping to create a living memorial in the shape of tree planting in a local park close to the crash site. On the 4th of July 1948 an Avro York of 99 Squadron, Royal Air Force and a DC6 of SAS Airlines collided in mid air as they waited clearance to land at RAF Northolt. To this day it remains the worst mid air crash in UK air accident history. After the crash local Scouts were used to help locate the crash site and assist. So we thought it would be fitting to invite the local Scout group to help create a memorial to the crash. If you have any information on the crash please get in touch. We have presented several ideas to remember the Armed Services on the Rock of Gibraltar, a very special place in the hearts of the team. The team have had prelimainary discussions about remembering the work of the Armed Services, one a memorial and others temporary displays to honour certain units and branches of the Armed Forces. We are working towards installing a sculpture to remember the work of the Hawker factory at Langley in Buckinghamshire (now Berkshire). 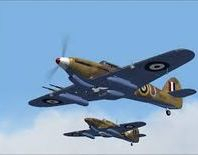 The most numerous fighter of the Battle of Britain was made there, the mighty Hurricane, but we will also remember the Tornado, Typhoon, Tempest and Furies, in the sculpture. Around the site will be other displays remembering other key events and aircraft created there, such as the Hawker Hunter. We are actively recruiting interested parties to build on the work we have done so far and that of a local historian who has done a great deal of work researching Langley's military links. 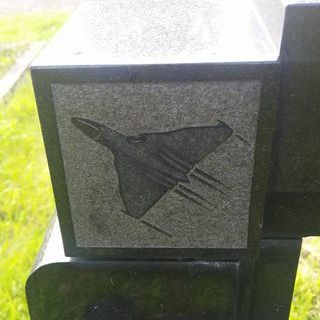 We have established contact with an experienced Foundry who have created several aircraft memorials and we are looking forward to working with them in the future. 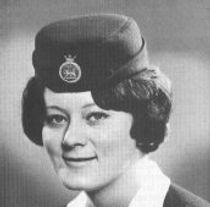 On making an emergency landing at London Heathrow, Jane helped rescue over a 100 passengers, and even though she could have escaped herself she returned into the now burning aircraft to rescue a disabled passenger. Sadly she perished in this rescue attempt and remains to this day the only female winner of the George Cross in peacetime (there have been other GC winners but these all involved medals that later became the George Cross). The only other winners are members of the Special Operations Executive in WW2, who were parachuted in Nazi Occupied Europe. We have been in touch with members of Jane's family and they have asked we don't hold an event, so we will of course honour their decision. We would like to thank the Yorkshire Post and BBC Sheffield among others whose coverage helped us find her family. A huge thank you to the team at Harkness Roses who had offered to create a special white rose to remember Jane by. We have ordered a special white rose to plant in honour of Jane in our memorial garden and will update as the flower grows. She was also remembered this year with the Yorkshire county flag flying at half mast. ACT UK have supported all The Memorial 'Mob' Projects to date and we would like to mention the fact they offer Free Personal Safety Tips on their Facebook & Twitter Feeds please support their work. They are also offering training courses to Military Related Charities (and their collectors) on Security and Lone Working Issues at present.